A handful of ships brought the war brides to Canada after WWI. Some of the transports include the smaller ships such as the Corsican, Grampian, Megantic, Melita, Metagama, Scandinavian, and the Tunisian to name a few, which could carry up to 2000 passengers. The Olympic, sister ship of the Titanic was by far the largest ship to bring soldiers and dependents to Canada. She could carry more than 5000 passengers. However, with a shortage of shipping after the war, a war bride might be placed on any ship that had space available. The voyage across the Atlantic Ocean to Canada took 7 days on average. Most ships left from Princes Landing Stage at Liverpool. But with many dockyard strikes during 1919, a number also left from ports at Southampton and Glasgow. During the winter months, the ships docked at the eastern ports of Halifax, Nova Scotia, and St. John, New Brunswick. Pier 2 in Halifax was kept busy unloading returning soldiers, while St. John tended to the ships that carried mainly families. As soon as the St. Lawrence River thawed in late April, the ships began landing at Quebec on a regular basis for the remainder of the year. Most of these young women, many who were travelling with young children or infants, were given berths in steerage, which was a far cry from the comfort of the second or cabin class. Seasickness was a common problem experienced by many on board the boat while travelling across the Atlantic. After the first few days of sailing, most people found their sea legs and were able to look after themselves again. However, a number of passengers were reported to suffer for the duration of the trip. The greatest risk of travelling to Canada during the winter of 1918/1919 was the Spanish flu epidemic. Medical officials at the port of embarkation checked passengers for symptoms of illness, but they had no way of knowing who had been exposed to the virus and would be contagious while on the ship. A number of war brides and their children succumbed to influenza on ships travelling to the Dominion during this time and were buried at sea, while others died shortly after arriving on Canadian shores. It seems so tragic that these war brides should perish before they had a chance to begin their new life in Canada. 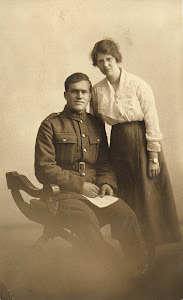 If you would like to add your war bride to a register of WWI War Brides, please send me an email at wwiwarbrides@shaw.ca or avidgenie@hotmail.com . 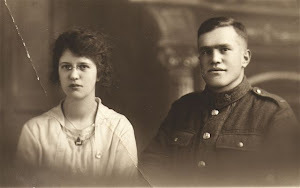 I'd also love to hear from you if you have questions about when your war bride came to Canada.